Designed as "cruiser F". Cost 36,523,000 marks. Scuttled at Scapa Flow, 21 June 1919. Salvaged 7th Dec 1930. Scrapped in Rosyth 1931-1934. All action times are CETAt 16:49, Von der Tann opened fire on Indefatigable at about 15,000 yards. Within 14 minutes she had scored 5 hits with 52 heavy rounds expended. One of the last shells (17:03) hit the fore turret and 30 seconds later Indefatigable exploded. After she had exploded, Beatty&apos;s line turned away. The 5th BS now opened up on the rear of the German line at 19,000 yards. Barham, Valiant and Malaya poured fire onto Motltke and Von der Tann. Barham&apos;s 15" hit at 17:09 under the waterline caused 600 tons of water to be taken on. Her steering was temporarily damaged. At 17:20 a 13.5" shell from Tiger hit A turret&apos;s barbette. The guns were jammed at 120 degrees. Tiger hit again at 17:23 near C turret killing 6 men. There was enough deck damage that the turret could not traverse. Some of her anti torpedo nets also starting dragging overboard and poised a serious threat to the propellers before being cut loose. by 17:23 Von der Tann was able to hit back as the range had closed to 17,500 yards, causing serious damage to Barham. After 24 rounds, she had to re-target New Zealand with her only working midship turrets. (Queen Mary blew up at 17:26 after Seydlitz and Derfflinger had targeted her).By 18:15 the last guns were also jammed. Von der Tann, at this point, had not guns to shoot with but was courageously kept in the line by Zenker to distract british gunnery. Added to this problem her speed dropped o 23 kts. D turret came back on line after 90 minutes of repair work. Soon after 19:30 the Grand Fleet was encountered. Scheer could not get away without sacrificing his slower pre-dreadnoughts. His 180 degree turn to starboard putting them on his disengaged side.At 20:19 Von der Tann was hit again (the last time by a heavy shell, a 15") by one of Jellicoe&apos;s battleships, HMS Revenge. The conning tower was badly hit and the 3rd Gunnery officer and the two rangefinder operators were killed while wounding all the others. Fragments fell into the condenser and cut all lights on the ship. At 20:30 B turret also came back on line and half an hour later, C turret. Now the midship turrets failed.At 21:15 Hipper ordered the battle-cruisers to increase speed to 20 kts, Neither Derfflinger nor Von der Tann could push past 18 kts (the latter because of clinker, the former because of the heavy damage sustained). They both fell in behind the II Sqaudron where they were joined by Mauve&apos;s pre dreadnoughts, Schlesien and Schleswig-Holstein at 00.05. Von der Tann narrowly missed being torpedoed by HMS Moresby at 03:37. The torpedo crossed he bow and was only avoided when the ship turned hard to starboard. 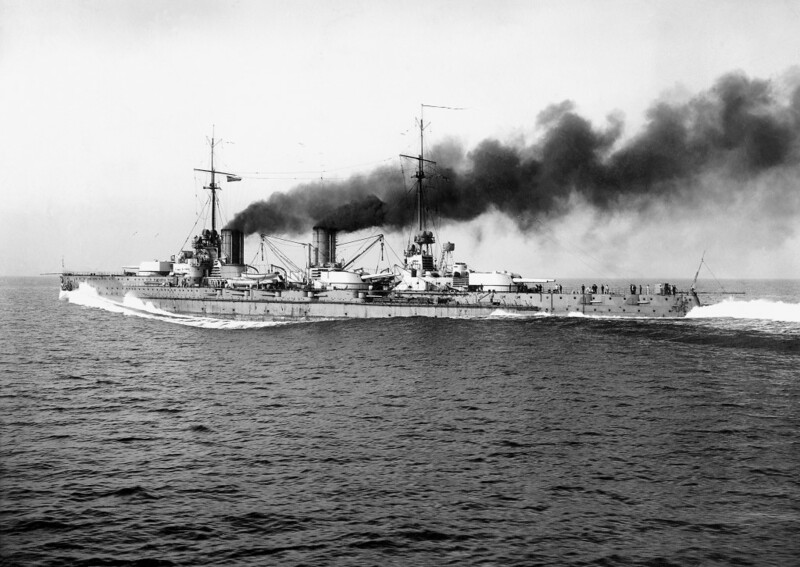 At 03:55 Hipper reported that the battle-cruisers were no longer a capable fighting force (Derfflinger and von der Tann each only had two operable guns, Moltke had 1,000 tons of water and Seylitz was struggling). 4 steam turbines, 4 shafts supplied by 18 Schulz-Thornycroft boilers. Rated at 43,600 shp. Because of financial limitations, reductions were made with VdT&apos;s main armament and instead of having the electrical turret system as was installed on the Nassau class (Drh LC/1906), she had the hydraulic elevated system (Drh LC/1907). For this reason her secondary armaments were increased. The guns were mounted on a system, then, that traversed electrically but used a hydraulic system for elevation. Secondary armament range was 18,400 using a 100 lb (54.3 kg) shell. 11 torpedoes stocked. Bow, stern and broadside mounts. Equipped with 240 lb (110 kg) warheads with a 2 km range when set at 32 kts (59 km /hour).